This is another example of how, when it comes to the Right and gay rights, the opposite is the truth. In this video, Kyle Kulinski talks about how Hillary Clinton praised Nancy Reagan, the late wife of Ronald, for her ‘quiet advocacy’ of AIDS victims. In a speech about the death of the former First Lady, Hillary claimed that Nancy had spent decades quietly promoting AIDS research and the treatment of its victims. She claimed that this softly-softly approach had finally paid off in the acceptance AIDS victims have recently gained in America. I’m posting this video because, like BoJo’s promotion of Brexit as a pro-Gay policy, the reality is the complete opposite. Nancy and her husband were determinedly anti-gay, and passed a series of acts stopping state expenditure on the treatment of the unfortunates, who had contracted this disease. Among the victims of their legislation was their friend, Rock Hudson. Hudson, the older people among us may recall, was one of the big TV stars, who fatally contracted the disease. In his desperation, the dying star personally contracted the Reagans to request that they allow him to be treated in an army hospital in Germany. It was refused. Of course, Hillary’s own stance on gay issues has also been mixed, to put it politely. Although she claims to be in favour of gay marriage now, in fact she waited until the very last minute, electorally speaking, to announce her new-found embrace of marriage equality. Before then, when the majority of voters were very definitely against it, she was with them. Now she’s changed her tune. And so did Nancy, posthumously. Now Hillary has taken back what she’s said, and cleared the comments from social media. But this incident still shows her own mendacity and duplicity in claiming a liberal platform for herself, which she does not actually support. Here’s the video. As for the Gipper, or whatever it was they called Reagan, he was responsible for more and worse horrors than denying medical treatment to those stricken with a horrible disease. Like supporting the various Fascist dictators and their murderous death squads in Latin America. These are good reasons enough to post up this video, but the point I want to make is that Hillary’s public comments whitewashing Nancy Reagan’s venomous hostility to AIDS victims isn’t isolated. After Hillary did it, Boris over here decided he was going to do something similar. And lo! and Behold! He was on the ‘Out and Proud’ website today, lying about how gay rights in Britain were all down to the noble Tories, and not due to those beastly foreigners across la Manche. The British and American Right are connected. When one lies, the other takes notice and tries to do likewise. Don’t be fooled. Whatever they tell you, it’s still the opposite of the truth. This is another meme attacking the Purple Duce I found over at the SlatUKIP site. 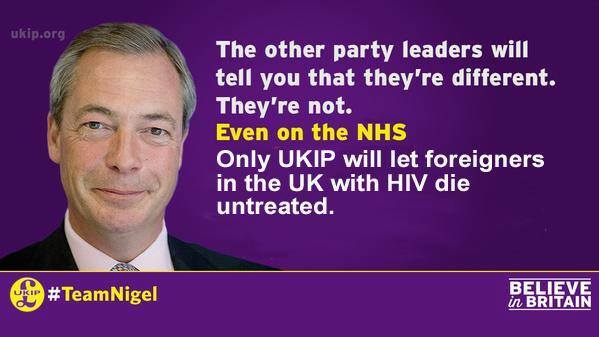 Farage at some point during the leader debates made the monstrous comment that HIV positive migrants entering the country should not be treated on the NHS. There have been reports in today’s Independent and Telegraph that the comments were made to cement the Kippers’ core voters, not to gain them anymore support. It’s so extreme that even Douglas Carswell, who has made more than his fair share of offensive remarks for the party himself, has refused to endorse it. Mike over at Vox Political has reported that this has been mooted before. I can’t remember whether it was solely by UKIP, or whether the Tories also had this brainstorm, but one or other or even both of the parties decided that an absolute wizard way to discourage immigration would be to stop sick migrants being able to claim NHS treatment. Apart from the obvious inhumanity of denying medical aid to someone, merely because of their migrant status, the idea’s also wrong because of the danger it presents that those with serious, communicable diseases would pass them on to the indigenous population because they could not afford treatment. It might discourage immigration, but it would almost certainly assist the spread of disease. But evidently, it sounds good to the morons and Fascists, who make up the Kippers’ core vote. It’s a good reason why anyone sane and normal shouldn’t have anything to do with them. Yesterday, the internet piled on to write ‘hilarious’ reviews of Nigel Farage’s new book – and arguably it was our fault. So we bought a copy and actually read it. Everyone’s got an opinion on Nigel Farage’s latest work. Amazon now has over 300 reviews – equally distributed between one and five star ratings, from his friends and foes. But none of them seem to have actually READ it. You can tell because they don’t have the verified purchase tick. We thought it was only fair if we bought the damn thing. See it as penance. 1. He credits YouTube for his rise! 2. It’s UKIP councillors who say the bad things, not the higher-ups. 3. Maybe women are a blind spot for him, he mentions boy (28) far more often than girl (6). 4. True to his brand values he mentions smoking 11 times and fags 4. 5. But is he really as keen on beer as he says? 6. He’s eaten at least three curries. 7. Farage mentions David Cameron 45 times. 8. Is Nigel obsessed with Nick Clegg? 9. He even opens the book with an anecdote about Clegg. 11. But blimey – an odd turn here, he complains about HIV charity the Terrence Higgins Trust. 12. 31 mentions for immigration, 10 for racism. 13. Because it’s all about the ‘banter’ with Nigel. 14. He distances himself from Britain’s most famous fascist by pointing out that Mosley was pro-Europe. At 15 the Mirror said they were ‘getting a bit bored by now’. They conclude that he doesn’t apologise to the long suffering reader, and the Mirror apologises to their readers for wading through this stuff. The article’s at http://www.mirror.co.uk/usvsth3m/bought-nigel-farages-new-book-5355449. Go there for the proof, and their appropriate comments on what they learned. Among the points to emerge is the fact that Farage is very careful about his constructed image of a man, who likes his ciggies and beer. He wishes to appear as an easy-going, approachable bloke with whom you can banter. He doesn’t like the Terence Higgins Trust, because they campaign for foreigners with AIDS to be treated free on the NHS. And of course, he puts a much lower premium on anti-racism than immigration. As for Oswald Mosley supporting Europe, that’s true. However, Mosley’s conception of a united Europe was basically that of the Nazi party when they were trying to appeal to a common European culture that they were supposedly fighting to protect against the threat of Jews and Communists. It doesn’t have anything in common with the idea of the modern EU, no matter what UKIP and the Eurosceptics say to the contrary. And it also doesn’t stop Farage’s party of swivel-eyed loons having more in common with Fascism than they want people to realise. The Fascists and Hitler were aggressively anti-Socialist, anti-working class and anti-trade union, not excluding their incorporation of the unions into their corporate state. This was done to control them, and give Mussolini’s regime the façade of having more to it than merely his personal dictatorship. As for the lower ranks of the party being responsible for embarrassing mistakes, this is just flannel and propaganda by Farage. He has said his fair share of embarrassing comments, such as his remarks on the privatisation of the NHS. The Kipper rank and file wanted him to shut up that time. The ‘Street of Shame’ column in this week’s Private Eye for 12th-19th December 2014 reports that staff at St. George’s Hospital, Tooting, discovered a photographer with a long lens camera hiding in the bushes near Accident and Emergency. 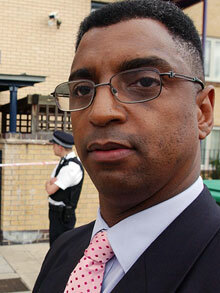 When he was asked what on Earth he was doing by hospital security, he replied that he was working for the Daily Mail. Janet Tomlinson, the Mail’s associate picture editor, confirmed this, when the hospital contacted her. She explained that the Mail had sent out photographers all over the country to snap ‘party people’. This means drunks about whom the Mail could publish long rant about how they were wasting NHS time and resources. According to the Eye, the hospital was spectacularly unimpressed by this and the Mail’s attitude, and threw the snapper off the premises on the grounds that the hospital was non-public regarding patient confidentiality. Fleet Street as a very long and dishonourable history of violating the privacy and sanctity of hospitals. 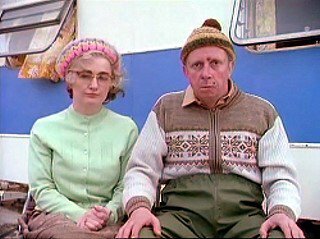 Either the Sun or the News of the World, as I recall, sent two of their journalists to burst into the hospital room where Gorden Kaye, the star of the WW II sitcom, ‘Allo, ‘Allo, was recovering following being struck down in the gales of 1989. As ‘Allo, ‘Allo featured the sort of bawdy innuendo common to a lot of the series written by Perry Croft, like Are You Being Served, one of the journos involved thought it would be a jolly lark to wave a cucumber around. The press also burst into the hospital room of Russell Harty, when the BBC chat show host was dying of an AIDS-related illness. Even after they were thrown out and physically barred from the premises, they still continued to invade the privacy of the dying man by renting a room in the house opposite and snapping him through the window. Recently I’ve posted a few pieces from Pride’s Purge, in which Tom Pride has described his own harassment by Mail journalists, who have tried to disclose his secret identity and threatened his friends. Just this week the good satirist has posted pieces about his complaint to the Daily Mail about their failure to protect adequately the identity of two children the Mail featured in a story about a family of ‘benefit scroungers’, who nevertheless still managed to spend £1,500 on Christmas. This was, of course, another hate piece on the unemployed and desperate. Given the tenor of the article, it was no surprise to read the remarks of another commenter on Tom Pride’s article that it had originally been written by the Sun, and the interview with the family had been obtained by deception. The family had been persuaded to give the interview, believing it would be a more neutral story about people on benefits and low incomes nevertheless finding ways to celebrate Christmas with style. Tom Pride’s complaint about the newspaper was in part provoked by the outrageous news that Paul Dacre, the foul-mouthed editor of the Mail, is now chairman of IPSO, the government body regulating press conduct. This reminds me of the joke in the Walter Matthau/ Jack Lemon comedy, The Front Page, about a journalist trying to track down and interview an escaped prisoner in the Chicago in the 1930s. Lemon plays the journalist hero, with Matthau as his sleazy, amoral editor. One of the final jokes in that movie is that Matthau’s character then goes on to become a lecturer in journalistic ethics at Harvard. We’re in pretty much the same situation here, with Dacre as head of IPSO. Only unlike the great comedies made by the Hollywood duo, that ain’t no laughing matter.